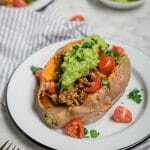 Whole30 Turkey Taco Stuffed Sweet Potatoes are a fun and easy dinner recipe the whole family love. Stuff a baked sweet potato with your favorite taco fixings and eat up! This recipe is also great for meal prep for simple and healthy lunches throughout the week! I know quite a few of you are doing another round of Whole30 before the holidays kick in. Just because you’re doing a Whole30 doesn’t mean you can’t enjoy some comfort food! 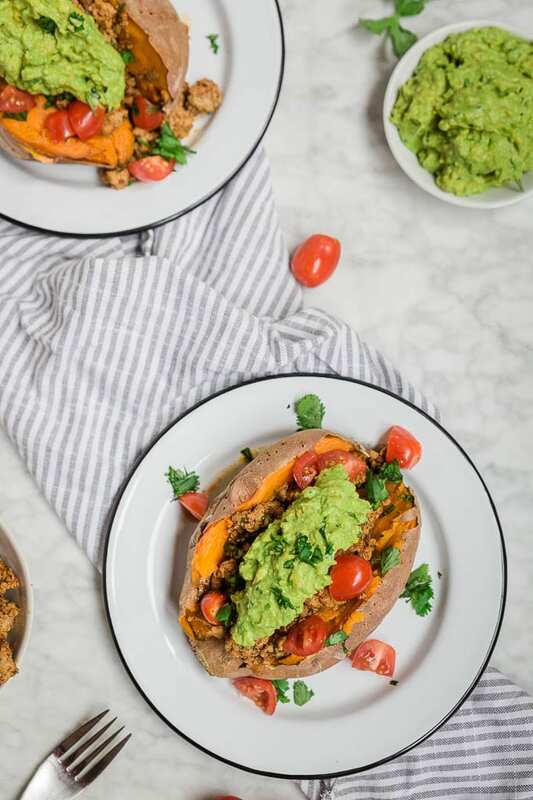 These Whole30 Turkey Taco Stuffed Sweet Potatoes has so much flavor, but without the gluten and dairy! Mexican food is sometimes hard to convert to Whole30. Corn tortillas, rice and beans are all staples in the cuisine. I’ve taken my favorite components of the classic taco and turned it into an easy Whole30 dinner recipe. 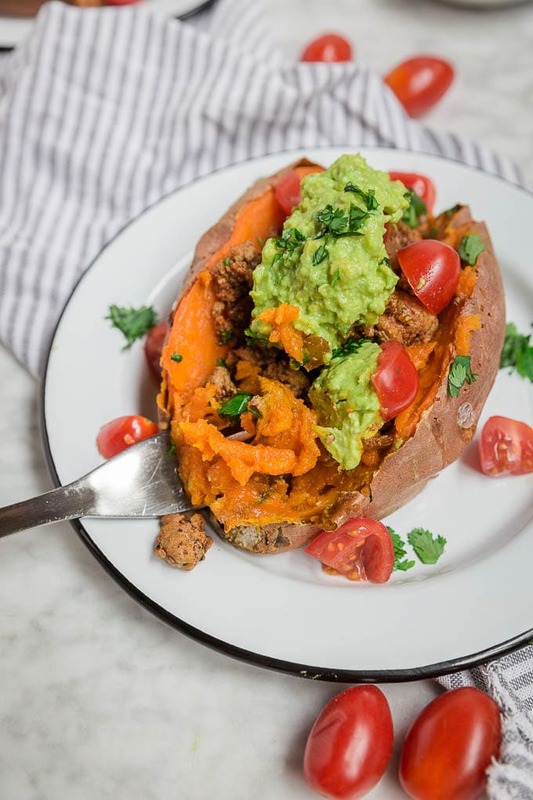 Baked sweet potatoes are stuffed with taco spiced ground turkey mixed with sauteéd onions. Topped with fresh, bright tomatoes and of course… guacamole! You could get more creative with the toppings if you would like, but I like to keep mine pretty simple as there is already a lot going on with the sweet potato. If you aren’t doing a Whole30, you have even more options: black beans, roasted corn, shredded cheese, or sour cream. Grass-fed beef is another great Whole30 filling option for these taco stuffed sweet potatoes. We like to switch it up sometimes between ground turkey and beef. And in case you’re like me and buy a whole 3 lbs of ground turkey and needs ideas to use it up, this Apple Sage Turkey Meatloaf is just what you need! It’s gluten-free, Whole30 and Paleo-friendly. There are a few ways you can bake sweet potatoes. My favorite is in the oven. It takes a little bit of time but it is oh so worth it! First, wash your potatoes, scrubbing thoroughly to loosen any of the dirt on the skin. Then dry them completely. Line a baking sheet with aluminum foil. Then pierce the skin of the sweet potatoes with forks (multiple times because no one wants an exploding sweet potato!). Bake at 400F for 45-50 minutes, until the sweet potatoes are tender and easily pierced with a knife. Do you like to meal prep? I do! These Whole30 turkey taco stuffed sweet potatoes are great for meal prep! Just bake your sweet potatoes in the oven as directed. Then, allow to cool completely before storing in an airtight container in the refrigerator. They’ll last up to 4-5 days in the refrigerator that way. You can easily make the taco seasoned ground turkey ahead of time and store in an airtight container in the refrigerator. Reheat in the oven or microwave with the prepared taco meat and top with fresh guacamole and tomatoes. Such an easy way to prepare for healthy lunches throughout the week! 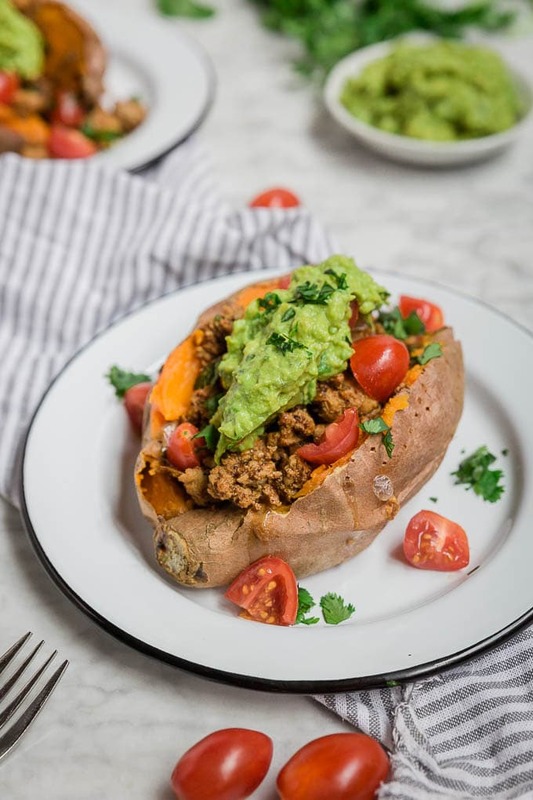 If you’re on a Whole30 and are craving some tacos, then this Whole30 Turkey Taco Stuffed Sweet Potatoes recipe is for you! Heck, even if you aren’t on a Whole30, you’ll LOVE this recipe! It’s so simple to make and healthy, too. You can have your tacos without all the grains, corn, gluten, and dairy and STILL have a fabulous dinner full of flavor. 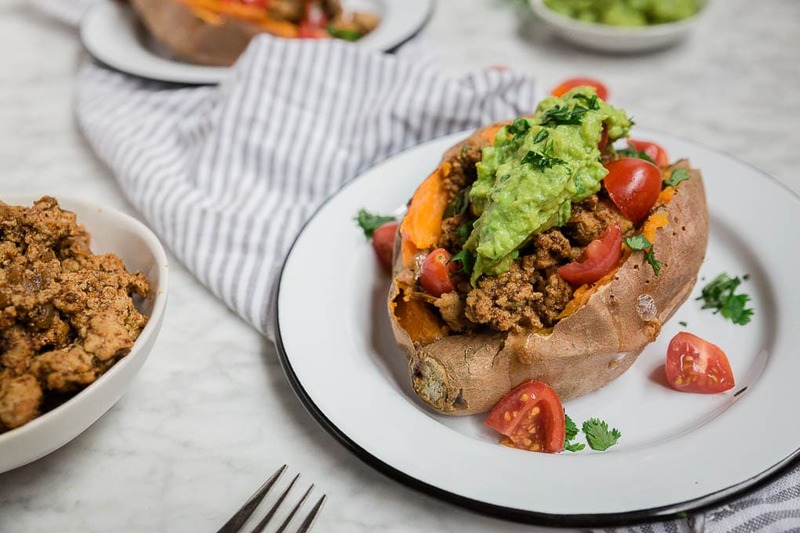 From easy dinners to weekly meal prep, these Whole30 Turkey Taco Stuffed Sweet Potatoes do it all. They're full of flavor, without any gluten and dairy, and are great for anyone on a paleo or Whole30 diet or lifestyle. Stuff a baked sweet potato with your favorite taco fixings, like guacamole and tomatoes, for a tasty weeknight dinner. Preheat oven to 400F. Line a baking sheet with aluminum foil. Wash sweet potatoes and scrub thoroughly to remove any excess dirt. Dry completely. Poke sweet potatoes all over with a fork and set on baking sheet. Bake at 400F for 45-50 minutes, until sweet potatoes are tender and easily pierced with a fork. While the sweet potatoes are baking in the oven, preheat a large skillet over medium heat with olive oil or avocado oil. Add turkey and onions and cook over medium heat, breaking up the turkey as it cooks. Cook for 8-10 minutes, until turkey is browned and no pink remains. Drain any extra fat. Add water and spices to the skillet and stir to combine. Cook for 2-3 minutes, until water is absorbed by the meat. Remove from heat and set aside. Make the guacamole just before serving. Mash the avocado with a fork. Add in cilantro, salt and lime and stir to combine. Taste and adjust any seasonings to your preferences. To assemble, cut the warm baked sweet potatoes down the center lengthwise. Fill with taco turkey meat. Top with diced tomatoes, guacamole and additional cilantro. Serve immediately or store separately in airtight containers in the refrigerator until ready to reheat and eat.